Daily High Point Awards are open to exhibitors who groom and braid/band their horse(s) and show in any qualified in-hand class. Exhibitors who show in all four 2018 shows will be eligible for the Year End Award which includes a beautiful plaque, a multi-color neck sash and an embroidered tote filled with grooming essentials. *Professionally groomed horses are not eligible. *​Currently the Kiss My Horse® Show Grooming and Turnout award is only available to exhibitors showing in the Nevada Fallon Horseman’s Association 2018 summer show series. Other horse show clubs! Show managers who would like to include the award in their show series may contact Anne at anne@kissmyhorse.com. Let's promote this wonderful and generous brand! 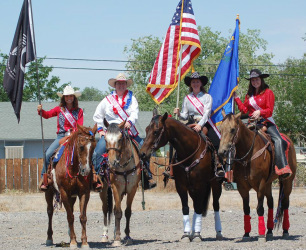 Gerogetown, CA: Today Kiss My Horse® announced their Show Grooming and Turnout Award in partnership with the Fallon Horseman’s Association of Nevada. Beginning May 19th exhibitors in qualified FHA 2018 Summer Series classes will be eligible for the daily award and Year End prize. Kiss My Horse®, makers of a full line of equine grooming products, believes that time spent grooming is one of the best ways to strengthen the bond between horse and rider. The company developed the award to encourage that bond and reward exhibitors for demonstrating excellence in show grooming and turnout for their horses. How the award works is simple and straight forward. Exhibitors are scored on their overall grooming skill and turnout for horses which they have groomed themselves and are showing in any in-hand class. Exhibitors with the highest daily score win the Daily Award and can accumulate points toward the Year End Award which includes a beautiful plaque, a multi-color neck sash and an embroidered tote filled with grooming essentials. Exhibitors are also encouraged share their grooming stories and photos on social media (hashtags #KissMyHorse and #GroomingToWin). Winners of a monthly Kiss My Horse® social media photo/story contest will also win a prize. Currently the Kiss My Horse® Show Grooming and Turnout award is only available to exhibitors showing in the Nevada Fallon Horseman’s Association 2018 summer show series. Kiss My Horse® is small California Corporation dedicated to delighting customers with innovative, natural horse grooming products of unparalleled quality. For more information visit www.kissmyhorse.com.